This flag was also commonly seen with the coat of arms in gold. After the Taliban defeat in November-December 2001, both the 1992 flag and the 1973 flag – and even the earlier April 1992 flag – were flown by different factions within the anti-Taliban forces. shahada and takbir on the top, etc. A coat-of-arms in gold/yellow has been spotted frequently, but white seems to be the official and more commonly used version. The draft calls for the 87-year-old former king to play a symbolic role in opening the Loya Jirga, which would elect a transitional authority to govern for about 18 months until a constitution is drawn up and a permanent government elected. (...) Until then, it suggests that most of Zahir Shah's 1964 [sic] constitution the most liberal political system the country has ever had  would be reinstated as Afghanistan's basic law. The flag of Afghanistan is tricolor (black, red and green) all pieces joined together vertically from left to right in equal proportions; the breadth of each strip equalling half of its length, having in the middle the insignia of the mehrab (an arch in a mosque where the praying congregation stands, facing the Kaaba in Mecca) and the mender (a many tiered pulpit placed to the right of the mehrab in a mosque, from which addresses are delivered) in white, flanked by two flags and ensconced in two sheaves of wheat. The entire constitution can be read at the Afghan Website. The same text was found on this Afghan government website with a link to a Draft Constitution of Afghanistan for transitional period by Dr. Salim Modjaz. Article 180 describes the flag, the same one used until 1974. The flag should be the same as that published in 1963 constitution, with the shahada added. 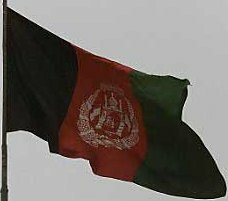 However, there is no "1963 flag" as the Kingdom of Afghanistan used the same flag from 1930 to 1974. This flag was vertical black-red-green. (...) All horizontal flags reported from Afghanistan are either mistakes of local officers, or mere journalists' errors. The royal flag should display a coat-of-arms. According to some sources, the present flag has the coat-of-arms as well (...). The coat-of-arms was (and most probably is) all in white and probably extends to the black and green stripes. Flag ratio is probably 2:3. The shahada is probably a part of the coat-of-arms, not inscribed somewhere else in the flag. Note that there were several versions of the coat-of-arms – for example, the date of ascending the throne by the royal dynasty (1348 i.e. 1929 AD) was not used in 1973-1974 and probably is not used at present. So I guess the shahada is inscribed in the lower part of the coat-of-arms, between a mosque and a wreath. According to some sources, an inscription "Transitional Authority" was added as well. This analysis of the chaotic and conflicting sources suggests that the present flag of the Islamic State of Afghanistan is a vertical tricolore of black, red, and green stripes. In the center of the flag, there is a modified royal coat-of-arms, in white, its diameter is probably ca. 1/2 of the flag length, flag ratio 2:3. Very good review. However, looking at the photos, I would rather support ratio 1:2.
at present, Afghan officers evidently do not know what they should hoist. The online edition of Spanish newspaper El Mundo reported 5 February 2002 the hoisting of the new Afghan flag over the presidential palace at Kabul. Note that the coat-of-arms is all within the red stripe. There is something above the mosque which was not included in the original royal era flags. I think it is either shahada or the inscription 'Transitional Authority' reported by some sources. I cannot infer the aspect ratio; however, the coat-of-arms included within the red stripe does not preclude a rather long flag (~1:2). All speculations about horizontal flags, coat-of-arms-less flags, and flags with different order of colors are hopefully falsified. Perhaps the clearest photo I have seen up to now of the presidential palace flag is this one from Yahoo! News. The flag appears to be quite clearly 2:3 and the arms falls well within the red stripe alone. The Chargé d'Affaires of the Afghan Embassy in Paris confirmed that the flag ratio is now 1:2. The official statement (quoted above) states of the three panels "the breadth of each stripe equaling half of its length" which gives three panels, each in the ratio of 1:2, and thus an overall proportion of 2:3. Date on flag: 1380 = 2002 C.E. Date on arms 1380 (=2002 C.E.) [click on image for larger version]. The Loya Jirga of spring 2002 voted the Afghan national flag with a few changes: yellow (gold) Coat of Arms instead of white dating "1380" (in Arabic writing = 2002) under the mosque instead of "1348" yet the colours did not change: black, green Pantone 3415c, red Pantone 186c. Mr Y. Koshikawa had a meeting with Dr. Abdul Wahab, Deputy Ambassador Afghanistan Embassy in London on February 17th 2003, who provided an official national coat of arms drawing last year. Dr. Wahab says that he knows some people use gold coat of arms in the national flag of Afghanistan but either gold or white can be used. In fact the Afghanistan Embassy in London hoists a flag with white coat of arms. He also mentions that in 2004 Afghanistan will establish a national policy from transitional government and the details of the official national flag will be specified by the Constitution. Until that point we will see variant national flags. He confirms Afghanistan national flag should have hoist at right side and the same coat of arms can be stitched on the back side of the flag. Today the Afghan embassy in Tokyo advised me that on June 27th 2002 Afghanistan officially changed its national flag from a white coat of arms in the center of the flag to a gold coat of arms which symbolizes the colour of a wheat wreath, a part of the coat of arms, and that the proportion of the new national flag is 1:2. The Tokyo embassy actually hoisted a flag with gold coat of arms since they re-opened in January 2003. I have just returned from a trip to New York where I visited the U.N. headquarters to check members flags. I bought a flag chart of U.N. members published in August 2002 which shows the Afghanistan flag with the gold coat of arms introduced on June 27th 2002 and I saw the flag flying in front of the headquarters. No more white coat of arms on the flag at least at the U.N. The 24 August 2004 online edition of the New York Times has a photo of a meeting of Presidents Karzai and Musharraf in Islamabad. Behind Mr. Karzai is a large Afghan flag with a gold coat of arms, and on the table is a small desk flag with a white coat of arms. It seems that even the people in charge of flag protocol on Islamabad can't decide which color to pick! Perhaps the clearest photo I have seen up to now of the presidential palace flag is this one from Yahoo! News. The flag appears to be quite clearly 2:3 and the arms falls well within the red stripe alone. I can see no difference with the 1930-1973 flag except for the Arabic wording on top of the mosque, between the top ends of the wreath. Between the mosque and the wreath there is certainly a year, the same as in the 1930-1973 flag. The Arabic numeral is 1348 which is the Arab lunar Islamic (hijri qamari) date for 1929 AD, when Zahir Shah's dynasty came to power. It is strange that the solar Islamic calendar, more frequent in Afghanistan and Iran, was not used. The four characters immediately below the mosque are definitely numerals, reading "1348", as best as I can make them out. (...) The top definitely shows the shahada. The two letters below the shahada (by the sides of the tower) look to me like they could be Allahu Akbar (God is [very] great). The scroll looks exactly like the scroll on Flaggenbuch 1939 and also like the one on the right part of the post-communist flag. If so, it could mean Afghanistan. It seems that the second (left) word is sulta (authority). Still can't make the first. The date below is 1348 (1929 AD), the year Nadir Khan took Kabul, deposed Habib Allah Khan, and was proclaimed King Nadir Shah, founding a new dynasty. The scroll text is Afghanistan-something: probably Transitional Authority or maybe just Authority. The arms in the flag should be mirrored because of the writings placed on them. The monument should be redrawn in a more traditional and less stylized way. The wreath should be gold and the ribbon white, as well as the monument and writings. The flags flanking the monument should have the black-red-green colours of the national flag. I asked Mr Masstan, Afghan Chargé d'Affaires in Paris, to confirm the gold wreath and black-red-green flags flanking the monument. He denied that information, saying that everything should be white on red. A photograph of Sibghatullah Mujadeddi, former President of Afghanistan and Chairman of Loya Jirga, or Grand Council, presiding at the third day of sessions in Kabul, Afghanistan on Tuesday, Dec 16, 2003, showed a table flag and behind a banner with the same emblem. The same symbol could be seen on the wall on a TV report about the "loya jirga". I think there's a strong presumption for this flag to be the loya jirga's flag. German television channel ARD (Tagesschau, 7 March 2002 and also afterwards) I have seen a variant of the Afghan flag. This was flying over Gardez, the city close to the battles between the US forces and the remnants of the Taliban. It was a horizontal tricolour of equal stripes black-red-green with a white arms in the center. The arms was only shortly visible, but it was obviously not the current [2002-2004] one. From my trip to Pakistan last week flags were seen at the border post at Torkham, the crossing point between Pakistan and Afghanistan at the Afghan end of the Khyber Pass. On the Afghan side was a flagpole flying a *horizontal* variant of the Afghan tricolor--black, red, green--with what was apparently the current national coat of arms stenciled in white, extending well into the upper and lower stripes. The stripes were separated by narrow strips of gold-colored fabric. Ratio was probably something like 3:4. The building housing the office of the Afghan border guards' commander had a short flagpole mounted on it with a plain vertical black-red-green tricolor, with no coat of arms at all. Afghan opium production surged after the Taliban took control of most of the country in 1996, and reached a peak of 4,030 US tons in 2000, accounting for 72 percent of the world market. Citing Islamic principles, the Taliban banned opium, virtually eliminating it from its territory in 2001. The ban remained in effect after the 11 September 2001 events, but farmers began ignoring it, as an important money-maker for the Taliban militia. In early April 2002, Hamid Karzai's interim government carried out a UN-backed plan to wipe out Afghanistan's poppy crop, once the source of 70 percent of the world's opium. The narcotic is the raw material used to make heroin. Source: this and this CBS News webpages. A friend asked me about a flag that he saw hoisted on a terrain military vehicle in Afghanistan that he saw on CNN some days ago. It was supposed to be photographed in areas under control of the Northern Alliance and the flag was a purely black one. Is that some kind of new Afghan flag or maybe just some local unit flag? Possibly a reaction to the purely white Taliban flag? Muslim South Asia is awash in single color flags of green, red, black, and white. They are mounted on makeshift poles outside shrines and mosques, especially outside the tombs of Sufi saints. Popular saints often have dozens of these flags of varying colors on display, not only on poles but hanging from telephone and power poles, trees, and so on. The Taliban's ideology would seem to prohibit reverence for such tombs, so I would be hesitant to conclude that display of a white flag at such a tomb necessarily had anything to do with the Taliban. These flags also attached to the rear of large trucks and buses, etc. I would not ascribe a specific ratio to them as they appear home-made. They seem to be of religious significance, but I was never able to ascertain whether different colors represented different sects. It may not make any difference, but the Taliban are a different sect of Sunni Islam, called (I think) Deobandi. The Wahhabi are from the Arabian Peninsula. While in general you are right about Muslim burial practice, there may be some variation here and there. Afghans, after all, are not Arabs. For all I know Turks and Albanians follow different practices too. I seem to recall an early edition of The Flag Bulletin had an article on Afghan grave flags, where monochrome flags in the four Arab/Muslim/Afghan colours, green, white, black and red, were flown on graves, with a significance to each colour. I remember green was supposed to be for descendants of Mohammed. Editor's note: see also Origin of the Pan-Arab Colours.